Download this free special-interest eBook to inspire your next trip. 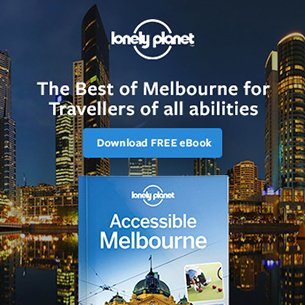 Lonely Planet’s new Accessible Melbourne guide is your free passport to the most relevant, up-to-date advice on what to see, with tips and recommendations for travellers with special needs. Discover Melbourne’s best wheelchair-friendly restaurants and shops, get active with accessible sports, and enjoy spectacular scenery, food and wine along the Great Ocean Road. We’ve gathered user reviews and insider tips from a wide range of travellers to ensure those with mobility, hearing or vision impairment get the most out of a Melbourne holiday. No matter what your ability, get to the heart of Melbourne.